When you want to combine the best of the outdoors sunshine and light with the weather protection of a tough hard-wearing roofing material designed for Australian conditions you can’t go past the wide range of translucent polycarbonate roofing products that are available from your local No 1 Roofing & Building Supplies store. Polycarbonate roofing panels are the closest thing to bringing the outdoors indoors. Polycarbonate roofing panels are made from a translucent plastic that comes in a variety of colours, widths, lengths and thicknesses. They are designed to reduce U.V. radiation and have amazing thermal qualities reducing the sun’s heat by as much as 69% in the summer. Polycarbonate roofing panels provide a perfect solution for protecting outdoor living areas from the harshest weather and are commonly used on outdoor living areas and pergolas, but are also widely used in greenhouses, shopping centres, sporting complexes and covered walkways. What makes a Polycarbonate Roof so good? Much less expensive than glass to install thanks to its light weight--the roof frame can be a lighter framework as well. 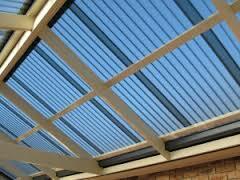 What do Polycarbonate Roof Sheets look like? 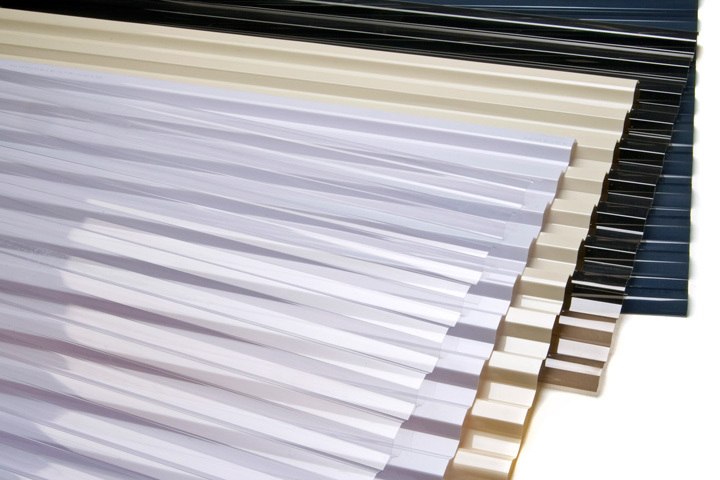 Polycarbonate roofing panels come in a wide range of colours and profiles allowing you to indulge your creative spirit. You can choose a style to blend in with the environment or to make a bold visual statement. WHAT ARE SOME OF THE RECOMMENDED POLYCARBONATE PANEL BRANDS? 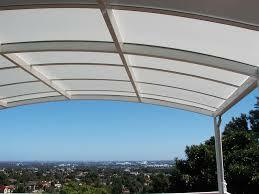 We have chosen to supply only the best translucent roofing products for years of trouble-free enjoyment. Most Polycarbonate roofing products come with a limited lifetime warranty including against hail damage from hailstones up to 25mm. Suntuff: the name says it all. Suntuf were the first Polycarbonate roofing panels in Australia and some 25 years of exceptional performance under tough Australian conditions have truly proven their value and backed up the Suntuf reputation. Suntuff are proud of the fact that their range prevents 99.9% of U.V radiation passing through the roof providing amazing protection for all sunlovers. 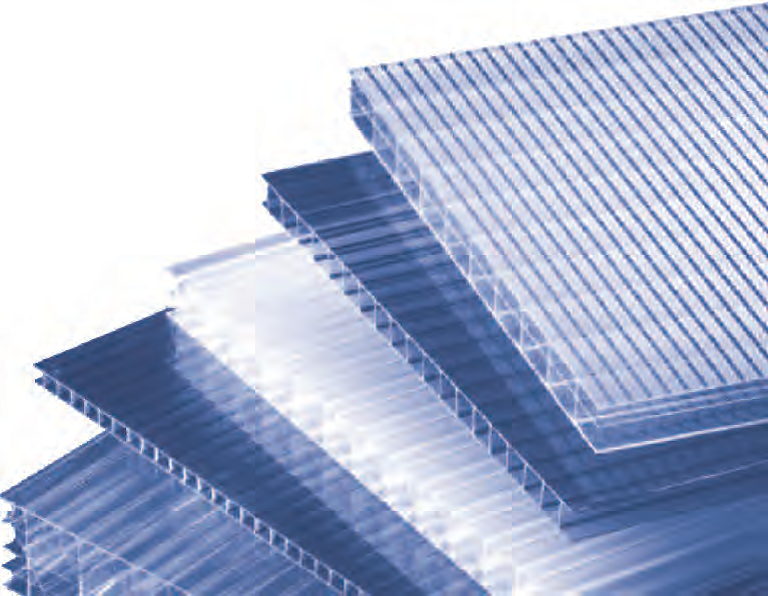 Suntuf produce three basic styles of Polycarbonate roofing panels: Standard, SolarSmart and SolarSmart Selective. The standard range provides a really cost effective way to enhance your outdoor living whilst the Solarsmart products provide optimal heat reduction. Suntuf comes in Greca, Trimdek or corrugated profiles. Laserlight comes in two product styles: Laserlight 2000 and Laserlight 3000. Laserlight 2000 is designed as a very cost effective option. Light transmission ranges from 19% to 93% according to colour. Likewise, heat reduction can be as much as 62%. Laserlight 3000 is designed for maximum thermal comfort with heat being reduced by up to 69% and reducing glare and light transmission by as much as 53%. Advanced Weatherguard technology keeps your Laserlight panels looking like new. Colours include: clear, opal, cream, bronze, grey, platinum, ice metal, and gun metal. A choice of corrugated, greca, and trimdek (trimdek is not available in the Laserlight 3000) profiles gives you some really exciting options for your outdoor space. The twin wall polycarbonate roof is a multi-wall plastic roofing product that has become very popular due it its unique qualities. It’s kind of like having a double-glazed window in your roof. Ampelite twin wall polycarbonate roofing products are a high quality low maintenance roofing solution that takes roofing for outdoor living spaces to another dimension. The twin-wall product is very tough and rigid giving it a long service life. It’s manufactured using lightweight materials making it cheaper for handling, freight, and installation and it comes with a ten year warranty. Ampelite blocks 99.9% of U.V radiation and is rated as suitable for high wind zones and for Bushfire zones up to BAL 19. The finely lined appearance of Ampelite adds a really elegant sleek look to any application and the wide range of colours will suit any taste. At one less than 1/6th of the weight of glass twin wall polycarbonate roof sheets are cheaper to handle and install and require less structural framing. Carbolite offer another superb roofing product with a see-through difference. Carbolite polycarbonate panels and awnings offer formidable sun protection for windows and patios. The ability to produce curved awning panels with minimal supporting structures is a real plus. Excellent thermal, shading, and U.V. reduction properties are standard throughout the excellent Carbolite range. 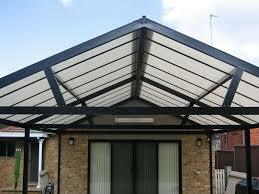 Solasafe is another great Ampelite polycarbonate roofing product. Solasafe comes in a range of levels and offers three different profiles. Level one allows for maximum light penetration with some variation in light and heat transmissions throughout its five colour range. Level two achieves an excellent balance between light and heat thanks to its cooler colours. Level three promises the most effective heat reduction thanks to its advanced metallic particle heat reflecting technology. Solasafe polycarbonate demonstrates 250 times greater impact resistance than glass and is strong enough to withstand heavy hail. Fibreglass roof sheeting or FRP (fibre reinforced polyester) is another tried and tested clear roofing product ideal for outdoor spaces. The Alsynite Ultra range of clear fibreglass roof sheeting features a unique polyester resin formulation with an innovative U.V. surface protection layer. It’s so good it’s backed up by a 25 year product warranty. A wide range of colours and profiles make it a great choice for walls and roofs where you want the natural light to come in but not the weather including building skylights, patios, and verandahs. Ampelite have also been making fibreglass roof sheeting for many years. Their exciting colour palette and super tough product reputation gives you another range of inspirational options. DOMESTIC - The domestic fibreglass sheeting is available in corrugated and the 5-rib (Trimdek) profiles. Minimum recommended roof pitch is 5º. Domestic grade fibreglass provides 99.9% protection from harmful ultra violet rays. It provides cost effective lighting through excellent spanning, light transmission and low thermal expansion. 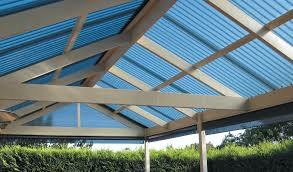 It is available in almost all current and superseded metal roofing profiles. Contact your local No1 Roofing & Building Supplies Branch for all the right advice. 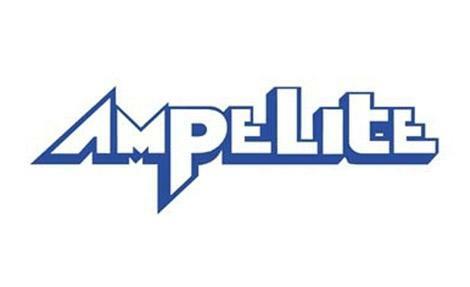 Ampelite is Australia’s largest and most experienced producer of industrial fibreglass sheeting. They produce Standard grade type SC, Premium grade ‘Wonderglas GC’ gel coated, and Special Purpose Sheeting including SR76 Fire Retardant, ‘Cool-lite GC’ Heat Reduction & ‘Webglas GC’ Woven Mat reinforced. The twin wall polycarbonate roof is a multi-wall plastic roofing product that has become very popular due it its unique qualities. It’s kind of like having a double-glazed window in your roof. The twin-wall product is very tough and rigid with a long service life, it’s made from lightweight materials which makes it good for handling and freight. But the thing that makes it so popular with the Australian backyard is the high transmission of light and the attractive look of the finished product. Saves heat by trapping the hot air between the 2 walls. This benefit alone helps you reduce heating costs by up to 50% compared to single wall polycarbonate roofing. Better light transmission, almost 85% of light compared to a layer of single glass, as well as the ability to diffuse light better which helps to reduce sunburn. It is certified under Australian Standards, is suitable for use in high wind areas – conforms to AUS standard 1170.2. Has an excellent Fire Rating – conforms to AUS standard 1530.3:2006 with an impact Strength makes to 250 times higher than glass, It also comes with a 10 Year limited written warranty. No 1 Roofing & Building Supplies are the premium supplier of polycarbonate roofing and carry a complete range of polycarbonate roofing accessories and sealant supplies for Sydney customers. We can supply all your polycarbonate flashings, apron flashings, barge and ridge cappings, infill strips and channels, and noise strips for the straightforward completion of your outdoor living project with complete peace of mind. Installing a polycarbonate roof, you’ll need a special purpose roofing sealant that is highly flexible, most of which are best dispensed via a caulking gun. The HB Fuller Ultra Clear™ product is ideal for translucent roofing installations, this highly flexible sealant will appear white when dispensed, but will dry clear for an easy application, and better visibility. It is Isocyanate & solvent free, has excellent resistance to weathering and UV, and resists yellowing. It guns out white & dries clear for easy application. Is highly flexible and is water based making for an easy wash up. 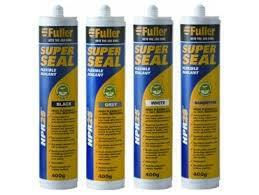 It can be painted over, is also mould resistant, and a great alternative to silicone or solvent borne sealants. As per the instructions on the label, all surfaces need be clean, dry, in a sound condition, as well as being free from dust, grease, oil, and any old sealants or other contamination. To get the best results, it is best if you wipe all surfaces with an alcohol-based cleaner, using a lint free cloth. If you are looking for a nice neat finish, we suggest that you apply masking tape to either side of the joint. Then gently squeeze the trigger to dispense the sealant and then push the sealant into the roofing joint to ensure complete filling.